Balenciaga dress in crushed velvet. Alexandre Vauthier cocktail dress in stretch-jersey. Deep V neckline. Long sleeves. Ruched, side wrap detail. Body-con fit. Viscose/spandex. Dry clean. Imported. 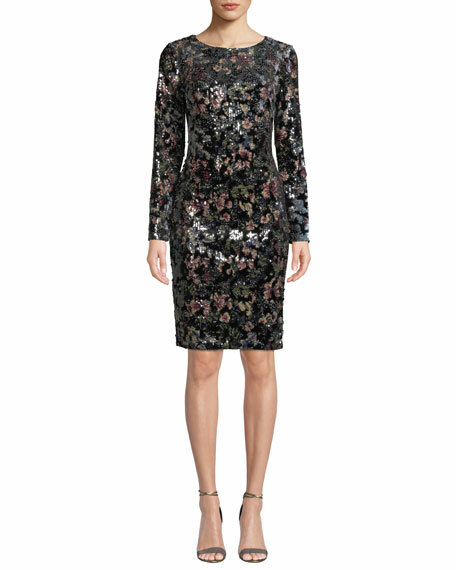 Badgley Mischka Collection velvet dress with floral sequins. Round neckline. Long sleeves. Sheath silhouette. Hidden back zip. Knee-length hem. Vented at back. Polyester/spandex. Polyester lining. Spot clean. Imported.